Entity that came to dialogue: Master Ron Hubbard. Interlocutor: Okay Master. Now I’d like to talk about the D. B Cooper case if you agree. Ron Hubbard: Sure, let’s start, and for those who will read it, Why don’t you make a short summary? THE D.B. COOPER CASE: On November 13, 1971 a Boeing 727 took off from the Portland International airport with a passenger that everybody knows as “D.B. Cooper”. Once in the air, he hijacked the airplane saying that he had a bomb, which apparently was false. The airplane had thirty six passengers and six crew members. When the airplane landed on Seattle, the hijacker demanded $us 200.000 and four parachutes which were given in exchange for the passengers. Then, the airplane took off again without the passengers heading to Mexico only with the crew. When the plane was at an altitude of 10.000 feet (around 3.000 meters), Cooper jumped with a parachute. The two jet fighters that were tracking the airliner didn't notice anything. The airplane landed in Reno without incidents and without the hijacker. The only track in this case appeared in 1980, when a boy found part of the ransom. The questions would be: Who was this man? Was D.B. Cooper his real name? Why he could not be identified and why he was never seen again. Interlocutor: Can we know what his name was? Ron Hubbard: His name is not important. Interlocutor: Did he die? Did he get sick? Interlocutor: How old is he at this moment? Ron Hubbard: He is a very old man and he is living in the northern region of Mexico. I can tell you that. Interlocutor: Okay. Nothing else about this matter? Interlocutor: In a previous session it was said about a primordial abduction, Am I confused or you don’t want to approach this topic at this time? Ron Hubbard: At least I won't approach it. Leave this topic to Johnakan. Interlocutor: But is there something like that? Ron Hubbard: Sure, but I don't want to approach it. This incident came later. Interlocutor: Ah! Did that come when he jumped with a parachute? Ron Hubbard: No, he landed perfectly on the ground. Interlocutor: Let’s see if I understood. 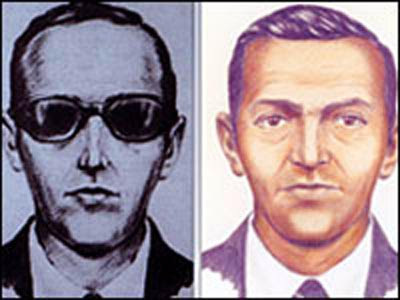 D. B. Cooper was a false name, he kept the money and he is living happily in Mexico. Am I right Master? Ron Hubbard: Yes, the true name of this person is David Warren, he is an unbalanced person, but with a tremendous knowledge. Interlocutor: Okay. Was he an expert in parachuting or something like that? Ron Hubbard: Yes, he had parachuting knowledge. Interlocutor: Why did he demand four parachutes? Ron Hubbard: Just to mislead the authorities. Interlocutor: Okay. He hijacked the airplane, he jumped with a parachute and he landed perfectly safe on the ground; Then, Why a boy said he found bills or there is nothing like that? Ron Hubbard: No. he landed perfectly on the ground. Interlocutor: So he put in a bag those 200.000 Dollars? Interlocutor: Then, the primordial abduction happened after these facts, Does it have something to do with this case? Ron Hubbard: That was a later fact in the region of Mexico and it doesn't have anything to do with this incident. Interlocutor: Okay, we leave it then for another moment. This entry was posted at Monday, November 30, 2009 and is filed under Mysteries and Enigmas . You can follow any responses to this entry through the .